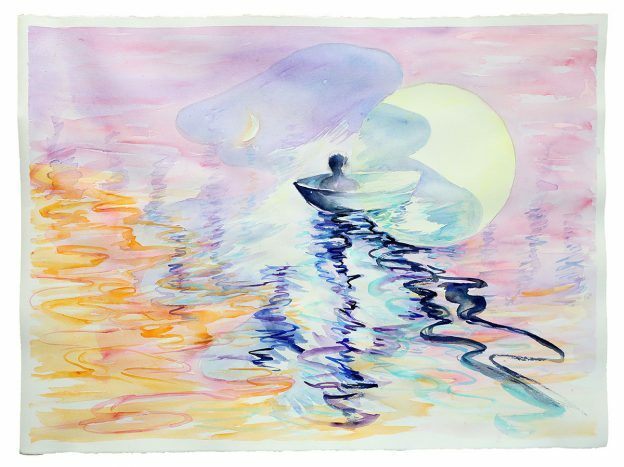 This delightful watercolor was inspired by the memory of the solar eclipse last year. I’m a total urban dweller, so Emerson and Thoreau have always seemed exotic literary hors d’oeuvres, nibbled delights too rich to dine on. Or too crunchy, like a big bowl of Grape Nuts cereal. And then there’s last summer’s car trip– a drive down to Oregon with countless other astronomy nerds that inexplicably becames something else entirely. I was in a crowd of people, and I could have been completely alone, swept away on gravitational waves. This entry was posted in New Artwork on July 31, 2018 by Tatiana Garmendia.